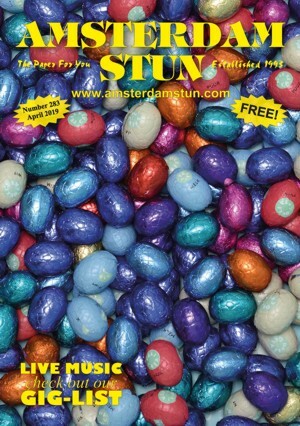 Click on the picture to open this edition of The Amsterdam Stun in a new window. To view it, you need Adobe Reader software which is available from here. ﻿April usually means I put something to do with Kings Day on the cover, but I couldn’t find any suitable photos in the Stun archives. Since the local council had a crackdown on street parties during the ‘vrijmarkt’ and moved the big events to the outskirts of the city, I haven’t seen anything that makes me think “That would make a nice Stun cover” but that won’t stop me trying again this year. While I’m looking, I’ll probably drop in a few bars, so there should be plenty of Kings Day photos in next month’s Stun. We had a St. Patrick’s Day theme on last month’s cover (photos from Paddy’s Day parties on pages 15-17), so I toyed with the idea of having a St. George related cover this time, but I couldn’t make an Amsterdam connection and it could have come over a bit Brexity. My home town voted 65% to leave, so when I met fellow Gravesenders Kirsten and Bill Mead from the Sharpeez in Maloe Melo, I didn’t mention Brexit, but I did find out that Bill went to St. George’s School in Gravesend. I discovered the existence of a “St. George Street” in Amsterdam, but I didn’t feel like getting on my bike to take photos, so I’ll save that for another year. Instead, I walked to my local Albert Heijn and got a few kilos of chocolate eggs; Happy Easter! What am I going to do with all that chocolate? I don’t want to make a pig of myself, so would anybody like to help? Talking of pigs; Josie, Sid and me won piggy banks for coming first at the Rock On Pub Quiz. Think you can beat us? The next one is on Wednesday 17th April; details on page 9. All of the usual stuff is here, and I threw in a couple of Brexit jokes, so enjoy your Stun.